Ocean Breeze Inn v Boracay Island, Filipíny: Zarezervujte nyní! 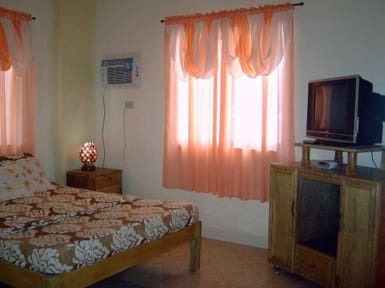 It`s a family managed, budget Inn ( Guest House Style ) with very affordable rates for short or long time stay. We offer a Guesthouse (all rooms have air condition). Above room type 3 Bed Private Ensuite is groundfloor upper right area of our Guesthouse with Sleeping Room (suitable for 3 guests) with Air Condition, Living room, hot water Shower/WC, verandah. Double Bed Private Ensuite is ground floor of our Guesthouse with Double Bed (suitable for 2 guests), Double Deck bed (suitable for 2 guests) and Air Condition, hot water Shower/WC or Double Bed / 2 x single Bed room with air condition and private bath in 1st floor of our guesthouse (+ 100 Peso). We have centralized cooking facilities for our guests with refrigerator and all important kitchen utilities. The Guesthouse has 2 floors for rent. Each floor has family or double room with Double Bed, Air Condition, TV, radio, internet access (per request), and bathroom with hot water shower / WC. The 1st/2nd floor of our guesthouse has a double bed or 2 x beds (single bed/double-deck bed) room with air condition, tv, radio and hot water shower / WC + balcony. Additional mattresses or folding beds are available, per request. Bicycles, notebook, and stroller are also for rent. We offer soft drinks, beer and optional breakfast (Continental or American breakfast). Ocean Breeze Inn is in a secure and clean surrounding. Caretaker day and night on compound. - No charges will be made. * Cancellations made on or after 14 days in advance of arrival - First-night cost payable.